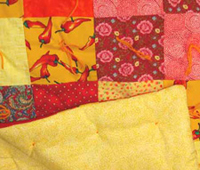 Are you looking for a soft, sturdy homemade baby quilt that is for "everyday" use? A baby quilt that can be washed over and over again? 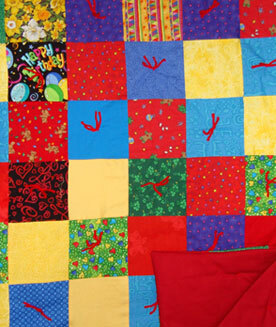 Or maybe a homemade baby quilt that has lots of colors, pictures of plants, animals, toys, and other interesting objects that can help your children learn? You need . . .
Our Prices Include Taxes and Free Shipping and Handling! They say that the one with the most fabric wins and I must be really close to winning! I have shelves and shelves of fabric, fabric on hangers all along the length of one wall, then more fabric in piles all over the place. My poor husband hardly has a place to hang his hat, but fortunately he only has ball caps and they can go almost anywhere. I can't help it, I love to feel the texture of the fabric and the yarn. The colors are wonderful and the patterns are fabulous. Putting it all together in new and inventive ways is very satisfying. I like everything about fabric and yarn, they are soothing and very therapeutic to work with! 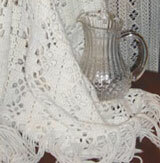 I especially like making baby quilts and afghans. I like to choose bright colors and arrange them in interesting ways. I mostly give the homemade baby quilts away to friends who are having babies and it is very enjoyable to sew and think about the new baby. I like to think about how cute they will be and what a miracle it is for a baby to be born. I ponder about and pray for this new life and for the mother that will care for the baby. 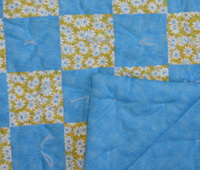 I'm getting close to having given away 100 of these baby quilts and afghans. Just think, all of those little babies warm and comfy in these homemade baby quilts. It turns out that some of them are now teenagers growing into adulthood. I like to think that my efforts made some little difference in their lives. Lately I have been thinking about these baby quilts, not only as something to keep them warm, but also something to help them learn. It is important to give these little ones lots of good experiences to get those brain cells working right. The bright colors in these homemade baby quilts can help, but I have also begun to tell the mothers about some educational games they can engage their young children in. Just the other day I read an article in the New York Times about how it is now known that children can learn math concepts at a much younger age than previously thought. It is important to begin early and my homemade baby quilts can help babies and toddlers along their way! I am only at the beginning stages, but I have started to collect some articles that show this to be the case. My educational research page has what I have found so far. I have come to realize that all of this fabric sitting around in my house isn't doing anybody any good (and it is starting to get in the way). And, since I don't have enough friends having babies to give away all of the baby quilts that can be made from this fabric, I have decided to try and put some homemade baby quilts into the hands of those who would appreciate a sturdy, beautiful homemade baby quilt sewn with love for these little ones. If you would like a really special quilt, send a picture of the baby and I will put it where I can see it while making your quilt. This will, of course, make it a little longer to get the quilt, since it won't be made yet! For years I have been using cloth gift bags instead of wrapping paper for giving gifts. Many people like the cloth gift bags better than the gifts that are in them! I use them at baby showers, birthdays, Christmas, or anytime that I give a gift to anyone. I'm hoping to use up some of my fabric making these gift bags. I have also made dice bags for gamers, but that requires heavier material than I usually use for my normal gift bags, so they are only done by request. 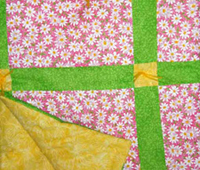 Our Homemade Baby Quilts Always Come With Free Shipping and Handling! 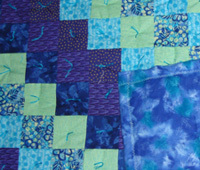 Several baby quilts are on sale. Check it out!